School Teacher Exam Pattern and Syllabus details also updated in this notification. Official website for submission MPPEB Madhyamik Shikshak jobs recruitment is www.peb.mp.gov.in/. Written exam will be conducted for 150 marks and exam duration is 150 minutes. Written Exam will be held on 19-01-2019 for this MPPEB Middle School Teacher jobs. 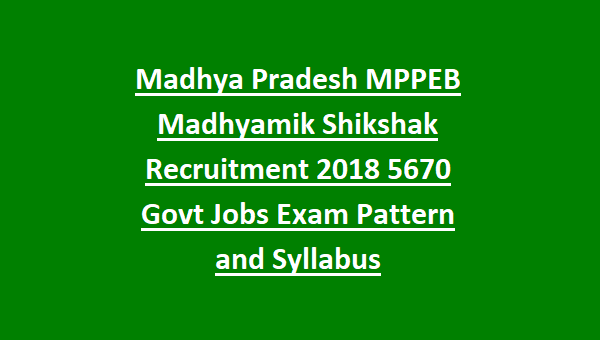 More information related to this MPPEB Middle School Teacher Exam Pattern and Syllabus, selection process, age limits and more is mentioned below. There are total 5670 Teachers jobs are in this MPPEB Recruitment. For General Male upper age limit is 40 years. For others upper age limit is 45 years. Degree with B.Ed or B.El.Ed or D.Ed or any Education Diploma which is approved by MP Education Department. For General and OBC candidates Exam Fee is Rs.500/- and for others Rs.250/-. 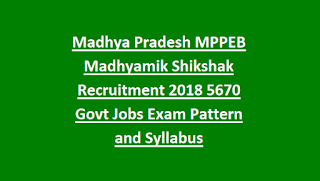 Candidates selection will be based on written exam only for this MPPEB Teachers recruitment. Written exam will be conducted for 150 marks. Total 150 questions will be given and each question carries one mark. Exam duration is 2 hours 30 Minutes. Interested and eligible candidates can apply online for this MPPEB Middle School Teacher jobs from 28-09-2018 to 30-10-2018. Official website to apply online is www.peb.mp.gov.in.